Sebastian Vettel, is a Germanian car racer born on July 7th, 1987 and is the youngest driver ever to score a point in Formula One while driving for Toro Rosso. At Monza in 2009 he became the youngest driver ever again to win a Grand Prix after taking his team to its first ever Pole position and first ever Grand Prix victory. Vettel is an overwhelming talent in the years to come. With more experience and exposure he is expected to reach the summits of Success. Vettel started racing at a very young age with Karts in the year 1995 and won almost everything that he could. In 2003 he decided to move into open car racing and thus came his stat the BMW Series. In the next year itself he won the 2004 Formula BMW Series and thus became known as the racing arena. In the next year 2005 he moved into the next level of Formula 3000 Euro Series, and he finished the year ranking in the 5th position. Williams BMW were quick to notice the overflowing talent in him and decided to bring him on board as a test driver. Other than the Euro series, Vettel spent his 2005 year in some rigorous testing for the Formula 1 team. He took part in the World Series Renault for just three times and won two among them. He also finished as the runner up of the Formula 3000 Euro series. Inspite of a serious accident with a sliced off finger, Vettel took part in the Masters of F3 at Zanvoort finishing in the 6th place. He ended an eventful year 2006 with more and more testing for BMW's other alliance, Sauber. 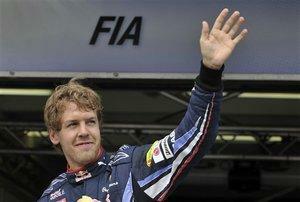 Throughout his testing career, BMW seemed to play a major role in how Vettel moved up to the Formula One platform. As he was leading the World Series by Renault Championships, Vettel was to replace an injured Robert Kubica at the US grand prix. Vettel qualified in the 7th place and he completed the race at 8th. After this he was released by the BMW Sauber and thus he moved to join the Red Bull Racing Team. The Chinese Grand Prix was the best for him. Vettel started the race at the 17th position and came forward to finish the race in the fourth overall thus fetching his points for Toro Rosso. This was the one and only match that fetched points for him.